Born in Amiens and named after his town’s patron saint, Firminus Caron (c1440-after 1480) was a contemporary of Johannes Tinctoris and Loyset Compère. Little is known about his life but what we do know, and the fact that this disc exists at all, is due to the work of those few tireless musicologists who do so much to bring 15th-century music to our attention. 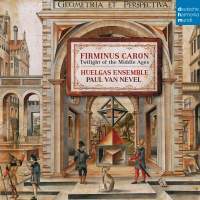 Paul Van Nevel’s disc comprises a composite Mass – movements from five of Caron’s four-part cantus firmus cycles, including, as one would expect, a L’homme armé setting – a chanson and three rondeaux. As ever with the Huelgas Ensemble, the unique warm sound, characterised by soft, dark vowels, creates a pleasing sense of unity across the whole album and delivers a smooth and intimate listening experience; Galaxy to the Dairy Milk of British counterparts, if you like. Yet this smooth tone is far from monotonous. Van Nevel frequently draws on groups of solo voices to highlight differences in texture so that his performances of Caron’s Mass movements are characterised by such interplay and further strengthened by a bold, firm plainsong line clearly etched into the polyphonic web. Such a staunch cantus firmus is particularly noticeable in the Credo. Caron’s surprisingly smooth polyphonic garlands create a flow and fluidity that inspire this ensemble, and when the polyphony cadences they then delight in his remarkably long final chords.